Pessimism among individual investors about the short-term direction of stock prices is at its highest level in more than four months. At the same time, optimism is near, though slightly below, its long-term average. The survey period runs from Thursday (23rd Feb. 2017) through Wednesday (1st March 2017). Most of the votes were recorded before Wed. (1st March 2017), when the Dow Jones Industrial average rose above 21,000. All three of the sentiment indicators remain well within their typical historical ranges. The potential impact that President Trump could have on the domestic and global economy continues to cause uncertainty and/or concern among some investors, while encouraging others. Some individual investors view the market's upward momentum as positive. Others worry that the sharp upward run will lead to a forthcoming drop in stock prices. 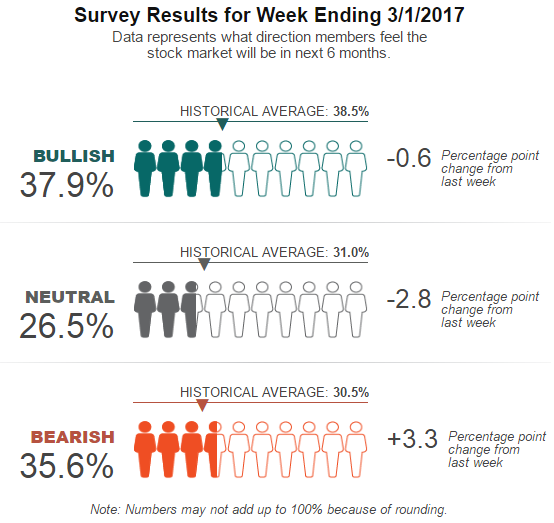 This week's special question asked AAII members what factors are most influencing their six-month outlook for stocks. Nearly three-quarters of respondents (73%) cited national politics, particularly President Trump’s polices and what actions Congress may take. Tax reform was mentioned by many (20% of respondents), followed by regulatory reform and uncertainty over what legislation will actually be passed. Just under 23% of all respondents listed the ongoing rally and the prevailing stock valuations, with several of these respondents expressing concerns about the level of valuations or that a drop could be forthcoming. Monetary policy was cited by 8% of all respondents, followed by corporate earnings growth (7%) and investor sentiment (7%). Some respondents listed more than one factor.